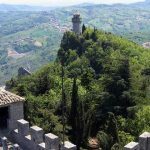 The popular history of a region is connected with the history of food, so if you want to learn more about the Republic of San Marino you can enjoy its food and wine tradition. With the abandonment of the countryside and the social and economic transformations, the ancient traditions of the food of San Marino were partly mixed with the needs of modern times. What has definitely been since ancient times is the passion for the “piadina”, a flat thin bread that still accompanies any type of food, from simple herb, cheese, to the finest foods meat. To the mixture of flour and water, once, was added a piece of corn flour and, on special occasions, was topped with pork lard. Another typical dish still popular is polenta (polenta in the cutting board), once served with sausage gravy and grated pecorino or in the more rich version with birds sauce, bacon and sage. Among the pasta dishes “i strozapret” made with flour, water and salt and served with meat sauce and cheese. 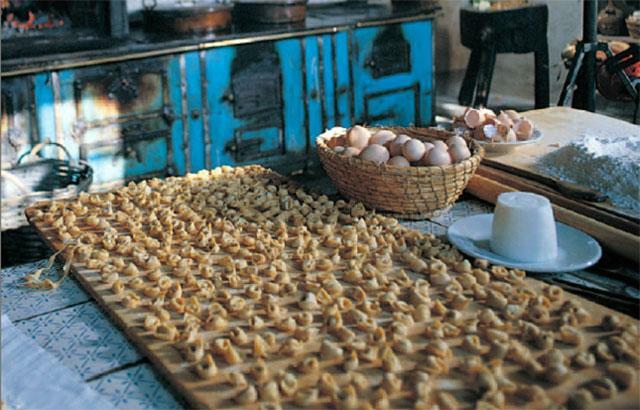 Do not miss tagliatelle, strozzapreti, ravioli and gnocchi. On Christmas Eve, the tradition is to consume the pasta and chickpeas, instead at Christmas Lunch you eat“cappelletti in brodo”. A dish for the brave, simple and tasty, to be eaten mostly in winter, are the pork rinds with beans. Falling into disuse the soup of the poor, the soup of “bobolotti“, composed of a layer of flour, water and salt, cut into large squares and cooked in water with brown beans and bacon. Traditional sweets from San Marino are: Pagnotta prepared with raisins and anise, eaten during Easter, Bustrengo prepared with breadcrumbs or cornmeal. Among the desserts symbol of San Marino you can find the cake Titan and the Torta Tre Monti, a specialtymade of large round wafers filled with cocoa cream and hazelnuts and chocolate decorations. Traditional wines of the Republic following the tradition of italian Romagna: red wine“sangiovese”, white wines “albana”, “biancale” and “moscato”. There has also liqueurs such as Tilus , ade with truffle and Duke of Guelph herbal liqueur. You can discover these traditional flavors in the manyrestaurants of San Marino, mostly during the Medieval Days, event in which the restaurant owners of the historic center offer tourists the ancient delicacies and local products. San Marino also produces extra virgin olive oil and honey: wildflower, acacia, chestnut, honeydew.